2012 was a great year for Big Steam on the Mainline, and this DVD presents some of the highlights! NKP 765 was called into service with the Norfolk Southern as the railroad celebrated its 30th anniversary. The 2-8-4 pulled weekend Employee Specials all over the system, with positioning moves during the week. Our journey with 765 began at the Fort Wayne Railroad Historical Society’s base and took us along the former Wabash route to St. Louis, MO. The big engine pulled four Employee Special trips in suburban St. Louis, accompanied by two NS Heritage Units in Wabash and Illinois Terminal paint schemes. Then we take a fast trip back to Fort Wayne with no diesels - just 765! The next chapter features UP 844, which was also heavily used in 2012 all over the Union Pacific’s 23 states to commemorate the railroad’s 150th birthday! First we head east from Council Bluffs to Des Moines, IA. After a stint at the Iowa State Fair, we left Des Moines for Salina, KS, by way of Kansas City. All along the way, crowds met the train at scheduled stops in all kinds of weather. The Class A railroads were not the only ones running Big Steam on the Mainline. Iowa Interstate Railroad ran 6988, one of its two QJs, in fundraising trips for two on-line community fire departments. Our cameras capture the 2-10-2 performing in its new “Americanized” livery, including some extended pacing scenes through the Iowa countryside. Running time approximately 95 minutes - Multiple videographers with tripod-mounted HD cameras caught the action from more locations and angles - Conveniently organized by chapters - Minimal narration - less talk, more action! 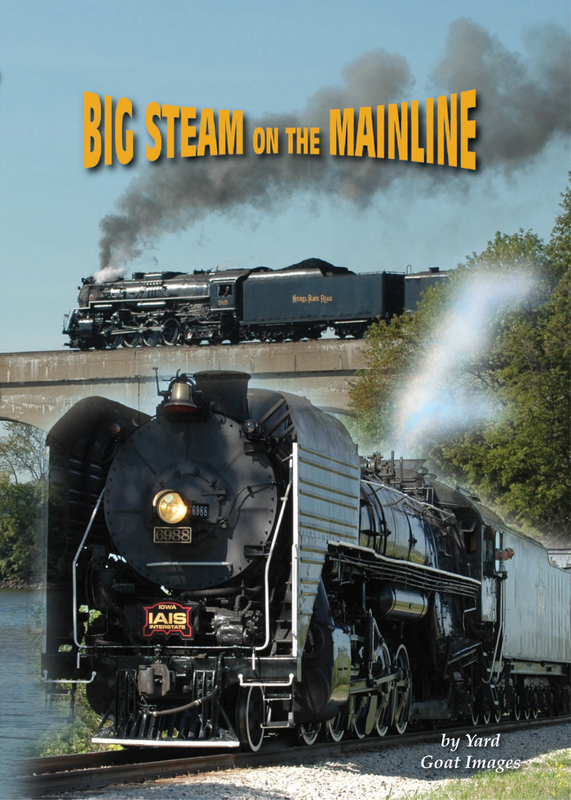 Preview - Big Steam on the Mainline DVD from Steve Mitchell on Vimeo.